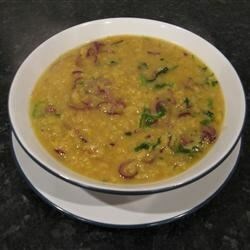 "This is a delicious Indian lentil soup with spicy red onions!" Bring lentils, water, and ginger to a boil in a saucepan. Reduce heat to medium-low and simmer for 10 minutes. Skim off and discard any scum that forms, then stir in the salt, ginger and turmeric, and simmer until the lentils are tender, about 1 hour more. Meanwhile, melt ghee in a large skillet over medium heat. Stir in onions and garlic. Cook and stir until the onions are soft and beginning to brown, about 10 minutes. Add the coriander, cumin, cayenne pepper, and cilantro. Cook and stir for 2 minutes more, then set aside. Once the lentils are done, discard the ginger slices, stir in the onion mixture and ladle into bowls to serve. I did not like the spices together at all.